Originally this entry was only intended to stand as a temporary item: if you visited earlier today, you will have seen it already. However, we decided we would be able to turn it into a permanent entry, thus allowing us to pour cold beers while we retired onto the patio to enjoy the Autumn sunshine. At some point the poll we link to later in this entry will no longer be for voting on today's entry, though the link should work to allow you to exercise your democratic rights on something. The only certainty is change. Cheers! One of the web sites we frequent is Erik Gauger's Notes from the Road (NFR). Erik has been selected as today's Cool Site of the Day (CSD), on the famous web site of the same name, created by Internet veteran Mike Corso. This is a well deserved honor: the site features creative travel writing of the highest caliber, accompanied by excellent photographs. You may visit Erik at the NFR home page, or go direct to the latest update, Atomic Agriculture on the Rio Grande. If you enjoy this fine site, and would like to contribute to its success before a wider audience, then please go to the CSD submission page to cast your vote: the poll is quick, easy, and anonymous; nothing is requested except your score and vote. It is a while since we featured one of Charles Winpenny's pictures: this one caught our eye because we imagine that house must be a very peaceful place to live. 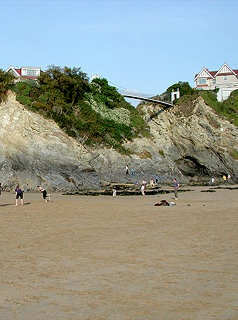 The scene is Towan Beach, Newquay, in the English county of Cornwall. A number of lines from the 'Seinfeld' series spring to mind, especially Mr. Costanza senior clenching his teeth and yelling for "Serenity Now!". The Seinfeld characters always become nervous when their 'significant other' relationships reach that dangerous 'unannounced drop-in' stage. None of these problems exist here, in what we imagine to be a haven of serenity. 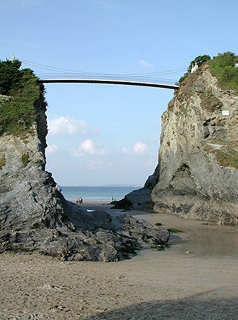 If only that bridge was a drawbridge! Madding or maddening, both are equally repellant. Never read 'Far from the Madding Crowd', Thomas Hardy's 19th century novel of courtships and relationships between the rustics in the fictitious English countryside of 'Wessex'? There is no need to need to trouble yourself by making the effort, just pop along to AWERTY.com for an almost effortless literary summary. The author claims Hardy was censored for his descriptions of sexual relationships: I think that what may have been meant was censured, but if I am wrong that in itself sounds like a very interesting line of enquiry. There are 68,999 other essays to choose from, so with this bluffers guide you may become erudite in only a few days. One of us was pontificating to she who must be obeyed that like his father he despised instant erudition. Herself did manage to deflate the significant other somewhat by pointing out that he had said exactly that same thing, at exactly the same point on our journey to the nearby town on the previous Saturday. A lesser man might have taken this to be a clear sign of boring decrepitude. However, we take it as a sign that we are at least consistent in our expressed beliefs. That aside, how we wish this resource had been available when we were cramming for English Literature examinations. Needs must when the Devil drives hardest, which was often the case in our misspent youths.